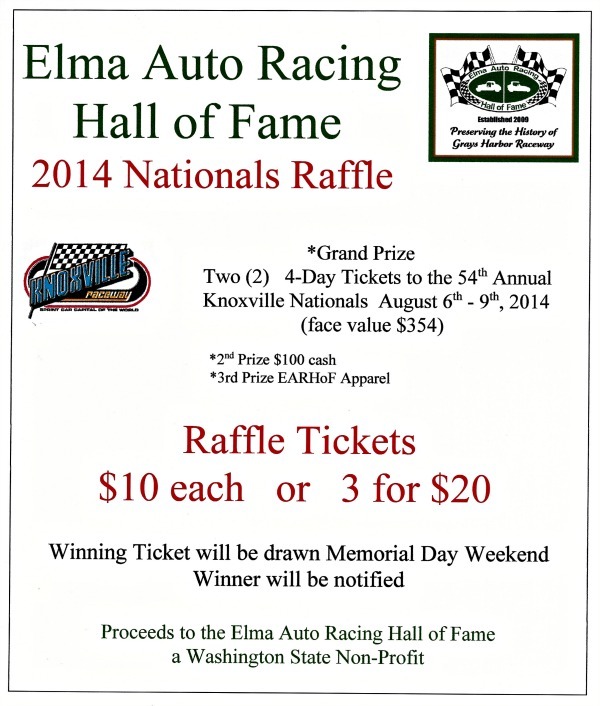 Elma, WA, December 9, 2013.....Two seats for the four days of the 54th Annual Knoxville Nationals are the grand prize of raffle being held by the Elma Auto Racing Hall of Fame. The front stretch upper mid-level seats for the biggest sprint car event in the world have a face value of $177 each, making the grand prize worth a total of $354. The 2014 version of the Knoxville Nationals will be held August 6th thru 9th, at the Marion County Fairgrounds in Knoxville, Iowa. The Nationals are an annual gathering that attracts the top sprint car drivers along with fans from throughout the world. A second prize of $100 cash and a third prize of an EARHoF apparel package will also be awarded. Tickets for the EARHoF raffle will be on sale until Memorial Day Weekend when the winning tickets will be drawn. Winners for the three prizes will be notified. Raffle tickets are $10 each or 3 for $20 and may be purchased from Cindy Badgett, George Wade, Glenn Walker, or Rich Leighty. Raffle tickets will also be on sale at EARHoF functions or may be obtained by sending name, address, phone number, and money to EARHoF, P.O. Box 203, Pacific Beach, WA 98571. All proceeds from the raffle go to the Elma Auto Racing Hall of Fame, a Washington State Non-profit that is 100% volunteer. Proceeds will be used to preserve and honor the history of auto racing at Grays Harbor Raceway, as well as provide scholarships for youngsters, connected with racing at Grays Harbor, looking to further their education. Information on the EARHoF, its mission and programs can be found at http://elmaautoracinghalloffame.webs.com. Oh yes, sent my $20 today! Gaylon Stewart is the winner of the pair of tickets to the 2014 Knoxville Nationals. Gaylon purchased his winning raffle ticket at the EARHoF Induction Ceremony in March. Congratulations Gaylon! Thank you to everyone that purchased raffle tickets and supported the EARHoF. We have never been, any tips on where to stay? Where to fly into? Fly to Des Moines, get a rental car, stay in Newton. Be ready to pay about $10 a day for decent parking.